What else? 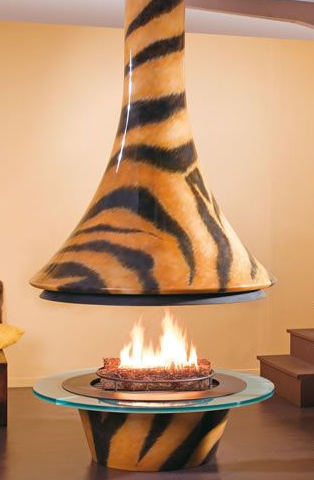 An Animal pattern fireplace will set the tone. The stunning ceiling hanging fireplace Eva from Bordelet is designed to take center stage in your house. Its outstanding circular shape makes it perfect for the middle of a room, where it can be freely enjoyed from any angle. The extractor hangs down from the ceiling, leaving a space in between the fire and the hood to create an open and sociable atmosphere. 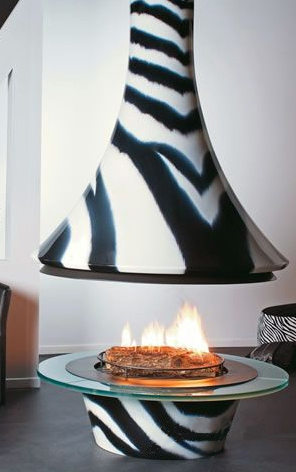 Bold colors and daring Tiger and Zebra print mean than the Eva fireplace is not for the faint hearted! Opening up your home to new ways of relaxing – the Eva hanging fireplace from Bordelet.